A composite image of the Kes 75 pulsar, the youngest such object identified to date in the Milky Way. High-energy X-rays are shown in light blue; low-energy ones are shown in purple. More than 2 million mph (1 million meters per second) — that's how incredibly fast some stuff in space is moving, according to new research using the Chandra X-Ray Observatory. Specifically, it's a pulsar-wind nebula — the shell of highly magnetized and high-energy particles surrounding a pulsar — that's clocking such amazing speeds. And the phenomenon has proven that the pulsar hiding inside, Kes 75, is the youngest such object discovered to date, according to a statement from the Chandra team. 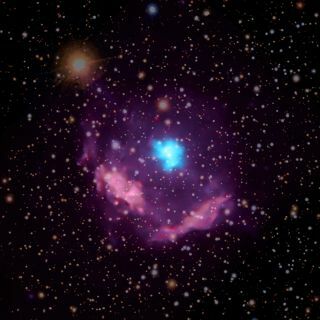 A pulsar is a particularly magnetic type of neutron star, the superdense stars formed by certain supernova explosions. Because of their magnetic activity, pulsars shoot twin jets of radiation across the universe, and because they spin as they do so, the result is often compared to the beam of a lighthouse sweeping around periodically. Scientists have spotted more than 2,000 pulsars to date, and Chandra first observed this particular one in 2000. In the new research, astronomers combined data gathered over the course of 16 years to pinpoint the speed of this object's pulsar-wind nebula. The incredibly fast speeds are likely because the pulsar-wind nebula is traveling within a bubble of gaseous nickel and iron created during the supernova, which has created a pocket of low-density space. And the speed calculation isn't just a boasting matter; it also told scientists that humans here on Earth should have seen Kes 75's predecessor explode somewhere in the range of five centuries ago. But there's no record of any such observations, likely because there's just too much dust in the way, the team concluded. Editor's note: This story has been updated to correct a numeric error in the first sentence.